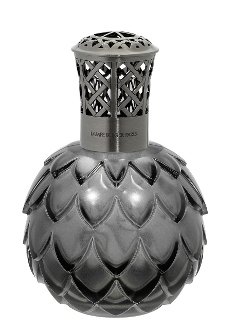 A re-edition of the legendary lamp, Artichoke by Rene Lalique (1927-1939). A tribute to the exceptional work of the glassmaker with its decorative and stylish leaves highlighting the thickness of the glass. An added touch is a Criss-cross top in an aged bronze or a tin finish. Available in frosted, Gray, or Amber. Lampe includes wick, snuffer cap, shiney vent cap, and instructions.